Take hot chocolate to another dimension with Hot Cocoa Pudding Mugs. 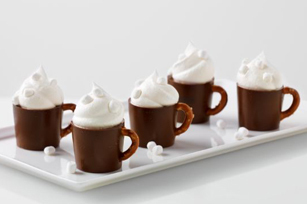 These edible Hot Cocoa Pudding Mugs will wow with their simplicity and adorability. Add 1-1/2 cups milk to gelatine in small saucepan; stir. Let stand 3 min. or until gelatine is softened. Cook and stir on medium heat 3 min. or until gelatine is completely dissolved. Remove from heat; whisk in melted chocolate. Cool 5 min. Beat pudding mix and remaining milk in medium bowl with whisk 2 min. Stir in gelatine mixture. Spoon into 24 shot glasses sprayed with cooking spray. Refrigerate 3 hours or until firm. Unmold desserts onto tray just before serving. Insert pretzel half into side of each for the mug handle. Top each with 1 Tbsp. COOL WHIP and a few MALLOW Bits. When serving adults, prepare the pudding with 3/4 cup cold milk and 1/4 cup crème de cocoa or peppermint schnapps, if desired. Please use alcohol responsibly.